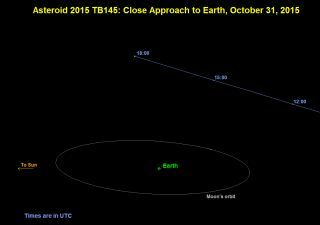 This graphic depicts the orbit of asteroid 2015 TB145 as it flies past Earth on Oct. 31, 2015. The big asteroid that will zoom past Earth on Halloween may actually be a comet, NASA researchers say. The roughly 1,300-foot-wide (400 meters) asteroid 2015 TB145, which some astronomers have dubbed "Spooky," will cruise within 300,000 miles (480,000 kilometers) of Earth on Halloween (Oct. 31) — just 1.3 times the average distance between our planet and the moon. Save 10% on these astronomy essentials. Use Code: Flyby. Astronomers plan to beam radio waves at 2015 TB145 on Halloween using a 110-foot-wide (34 m) antenna at NASA's Deep Space Network facility in Goldstone, California, then collect the reflected signals with the Green Bank Telescope in West Virginia and Puerto Rico's Arecibo Observatory. Such work should reveal key details about the space rock's size, shape, surface features and other characteristics — including, perhaps, its true identity. "The asteroid's orbit is very oblong with a high inclination to below the plane of the solar system," Lance Benner, of NASA's Jet Propulsion Laboratory in Pasadena, California, said in a statement. "Such a unique orbit, along with its high encounter velocity — about 35 kilometers or 22 miles per second — raises the question of whether it may be some type of comet," added Benner, who leads NASA's asteroid radar research program. "If so, then this would be the first time that the Goldstone radar has imaged a comet from such a close distance." Asteroid 2015 TB145 will be too faint to spot on Halloween with the naked eye, but anyone who's interested can get a look at the object online, thanks to live telescope views provided by the Slooh Community Observatory and the Virtual Telescope Project. The Virtual Telescope Project will air a webcast at 8 p.m. EDT on Oct. 30 (0000 GMT on Oct. 31), while Slooh's broadcast begins at 1 p.m. EDT (1700 GMT) on Oct. 31. 2015 TB145, which was just discovered on Oct. 10, completes one lap around the sun every three years or so. It's part of a near-Earth object (NEO) population thought to number in the millions. Just 13,000 NEOs have been detected to date, meaning there are lots of potentially dangerous space rocks cruising through Earth's neighborhood unseen and unnamed. But there is some good news: Models suggest that about 95 percent of the biggest NEOs — the ones that could threaten human civilization if they hit Earth — have been discovered, and none of them pose a danger for the foreseeable future.